In my most recent “What’s In Kate’s Lunch Bag?” post I shared how much Kate loves chili, and this Chicken Taco Chili is one of her favorites. It’s incredibly simple to make, and easy to customize with what your family likes. Plus it’s a crock pot recipe so you can fill it up before you leave for work, and dinner will be ready when you get home! 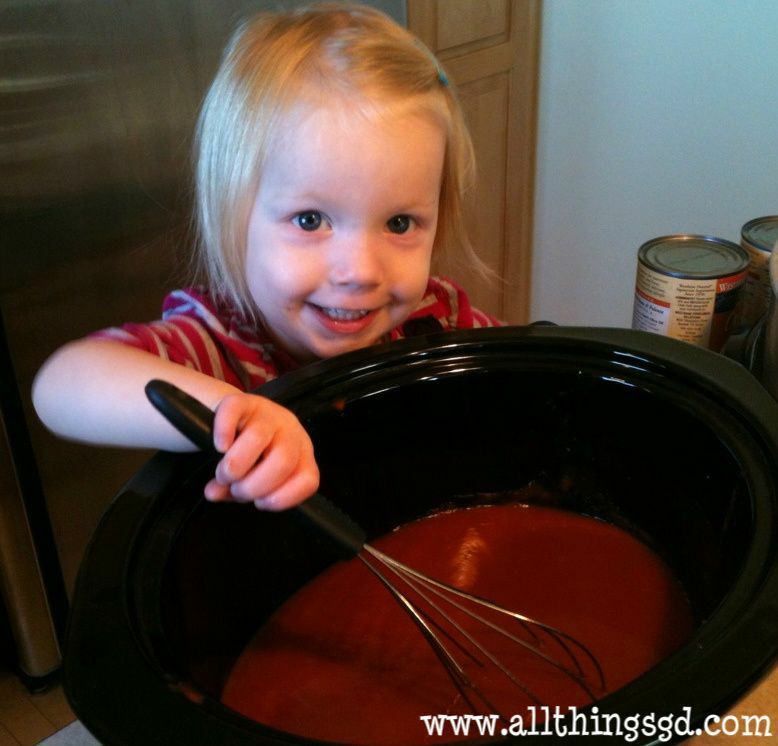 Pour tomato sauce and taco seasonings in crock pot. Using your emptied tomato sauce cans, add 1-2 cans of water to get it to the thickness you’d like. Stir to mix well. Stir in black beans. Lay the two raw chicken breasts on top. 30 minutes before serving, remove chicken breasts, shred on a plate (the chicken is really tender at this point so it will practically fall apart), and stir shredded chicken back into the crock pot. Serve with your favorite sides and toppings. We like to eat our Chicken Taco Chili with a little bit of cheese sprinkled on top. We also like to scoop it up with our favorite Archer Farms Flax Seed Tortilla Chips. Tip: I like to make a double batch of Chicken Taco Chili and freeze the extra in salsa jars. It’s a great way to store smaller portions of chili for daycare and work lunches! This is a very basic recipe, so feel free to customize it with ingredients your family likes. You can add corn, diced tomatoes, diced chili peppers, onions…your options are endless! *THIS is the recipe I use for homemade taco seasoning. I make a great big batch of it and store it in my pantry in an emptied (and cleaned) salsa jar (seen in this post). I am DYING to try this. In fact, I am going to make it on Wednesday (swimming lesson day, so we are always running late on dinner that day; this way will just be ready). And hey, that means that I can review it for you *in person* on FRIDAY! Hooray! Thanks for sharing. Only 5 Ingredients?! I can get onboard with that. I never thought to make taco seasonings, but it’s such a great idea. Kate’s picture is so sweet, I bet she’s a good helper. @jbhat: Oooh, I hope you like it! So excited that I get to hear your review IN PERSON! Woot! Thank you so much, Alison. I hope you like it! @evsmarie: I’m so happy to hear the Apple Plum bars are a hit at your house! If you click on “I Am Not a Chef” under Topics in my sidebar you’ll pull up all of the recipes I’ve posted. Hope that helps! This is in my crockpot right now, with some additions. Do you also feel smug and supermama-like when you start dinner at breakfast-time? How many people does it make food for? Ooooh this looks good. Pinning to my recipes board! @elsieforever: Without a doubt! And I like to make sure everyone I see during my workday is fully aware that I already have dinner made. Howdoyoulikemenow? @J. Obrien: I’d say 4-6 adults, easily.